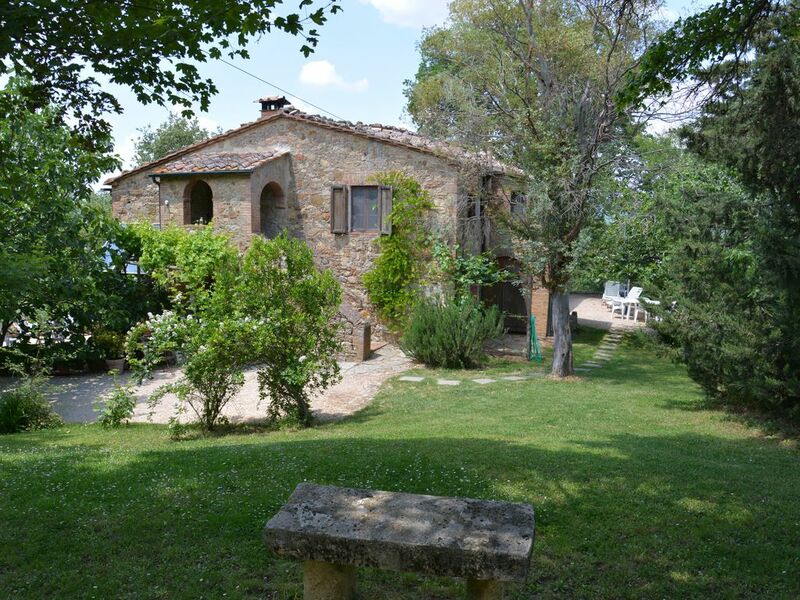 Home holiday - The CASETTINO is an old farmhouse in the countryside of the Tuscan countryside, in the middle of a nature reserve wildlife. It offers a stay of complete relax and also the possibility to quickly reach the main art cites of Tuscany: Florence, Siena, San Gimignano, Pisa, Monteriggioni, Volterra and seaside resorts (Golfo di Baratti, Castiglion della Pescaia, Follonica) and the island of Elba. Open all year round. Home holiday has 3 apartment for 2/4 people, with private entrance, private garden and swimming pool panoramico.La is cozy and surrounded by lavender, olive trees and cypresses. Home holiday - The CASETTINO is an old farmhouse in the countryside of the Tuscan countryside, in the middle of a nature reserve wildlife. It offers a stay of complete relax. The kitchen is fully equipped with hob, fridge, freezer, electric oven, crockery and washing machine. Very nice place! Very nice hosts! Abbiamo trascorso il ponte del 25 aprile in questa favolosa location e non poteva trovare una soluzione migliore. La casa è immersa nel verde delle colline toscane regalandoci un clima di totale relax e silenzio. La posizione è strategica per visitare le città come Siena, Volterra e San Gimignano. La gentilezza e grandissima ospitalità della Fam. Rossi hanno reso il soggiorno ancora più piacevole. E' stato davvero un privilegio conoscerli. Non mancheremo di organizzare una seconda vacanza presso di loro. Grazie! Il privilegio è stato reciproco; è veramente inusuale ricevere ospiti che, come loro, hanno mostrato un profondo interesse e rispetto per il nostro ambiente. Saremo felicissimi di ospitarli di nuovo. sont très sympatiques.Le vin de rossano est à goutter!Bel endroit pour decouvrir cette belle région." "Tres bel environnement, tres calme, joli cadre. Appartement chaud car pas de ventilation possible>. "La Toscane dans toute sa splendeur!! A recommander à ceux qui souhaitent passer des vacances au calme, à proximité des sites touristiques et des villages typiques. Un environnement au milieu des vignes et des oliviers, une location très propres et fidèles au descriptif. Enfin un accueil très chaleureux et irréprochable. Accueil personnel détendu, cadre reposant dans la campagne entre Sienne et les collines métallifères, gites propres et bien équipés, situé sur un terrain au pied de la colline d'où domine Radicondoli, tout en conservant une vue sur la campagne. Encore merci et bravo à Rossano et Grazia. Tous les parfums et images de votre bel environnement se rappellent à chaque fois que nous utilisons votre huile maison. To reach The CASETTINO take the A1 motorway towards Rome, exit at Firenze Certosa, then take the Firenze-Siena and exit at Colle Val d'Elsa Sud Continue following the road signs for Radicondoli (about 25 Km from Colle val d 'Elsa). The Casettino is 1,5 km from the medieval village of Radicondoli where you can find restaurants, pizzerias, tennis court. Radicondoli is a small medieval village, whose origins date back to very ancient times, in fact the first archaeological traces date back to the Etruscan period. Its appearance has been preserved almost unchanged over time, both in the urban structure and in the landscape. The territory of the municipality of Radicondoli is located on the eastern edge of the Colline Metallifere (Metalliferous Hills) is almost entirely hilly, with an average altitude of 510 meters above sea level. In the territory of the municipality, it is located one of the eleven “Nature Reserves” established by the Province of Siena, “the nature reserve of the Cornate and Fosini” created in order to safeguard and protect areas with high value natural, historical and cultural heritage. The territory of Radicondoli is rich in many species of plants and animals, including wild animals that inhabit or pass through during migration in these natural environments, some are very rare, such as the Peregrine Falcon and the Lanner Falcon. Among the most popular and well known are also the wild boar, roe deer, fallow deer, hare and pheasant. Radicondoli is also rich in art; the main monuments worth visiting are: the Collegiate Church, with its majestic bell tower, the church of the Crucifix, the Old Parish Church of Our Lady and the Convent of St. Francis of Observance, just to name a few. Insidethe Collegiate Church several paintings are preserved, including the painting of “Our Lady of Mercy,” of considerable artistic value, created by the Sienese painter Naddo Ceccarelli, a pupil of the school of Simone Martini and Lippo Memmi. Radicondoli offers in addition to the splendid natural, architectural and artistic characteristic also typical dining places: Pizzeria La Pergola, Bar Restaurant Il Nazionale, Trattoria La Fornace, Restraurant Dietro le Mura (Behind The Walls) located in the small village of Belforte, part of the municipality of Radicondoli. For those who love sports there is an area that includes a football field and two tennis courts. Especially in summer numerous events are carried out, such as “Estate a Radicondoli” (Summer in Radicondoli), a series of shows that boasts a tradition that dates back to 1986 and has attained a reputation nationwide. Another characteristic summer event is represented by “Festa di San Giovanni” (Feast of St. John), during which you can enjoy a range of local productions. In the country there are also major services, such as pharmacy and surgery, as well as grocery stores, where you can buy local products. In the town center there is a wi-fi area completely free, organized by the Municipality of Radicondoli. Radicondoli is located in a strategic position that allows you to quickly reach the main art cities of Tuscany: Florence, Siena, Pisa, Lucca, Volterra, San Gimignano, Monteriggioni. For those who love art, then a must is the impressive Basilica of San Galgano, which thanks to its special acoustics, is home to numerous classical music concerts. A short distance from Radicondoli are also the Chianti vineyards and attractive seaside resorts on the Tyrrhenian coast, including: Follonica, Castiglione della Pescaia, the Etruscan Gulf of Baratti, just to name a few. Also noteworthy is the ability to reach, via the port of Piombino, Elba Island, which together with the other islands of the Tuscan Archipelago, is part of the largest Europe Marine Park, the largest protected area of European seas. The park is characterized by a great variety of habitats populated by different forms of life.From the beaches of the Elba to the rocky cliffs of the western Capraia, a myriad of plant and animal species live in every corner of one of the most fascinating natural environments: the sea. For those who want to dive into the past, with all its history, there is the opportunity to walk (or drive) on the Via Francigena. It represents another great wealth that belongs to this territory, in fact the Francigena has been declared by the Council of Europe Major Cultural Route, which crosses Britain, France, Switzerland, Italy to the Vatican State. It was launched by the Longobards and later incorporated into a pilgrimage route. In Tuscany, it crosses the province of Massa Carrara, Pisa, Lucca, Florence and Siena. The point of connection to the Via Francigena, closer to Radicondoli is near Monteriggioni, Abbadi Isola and leads to Siena. For those who want to perform physical care, but also regain their physical fitness, their beauty, the ideal is to spend a day of relaxation and pleasure at the Spa of Petriolo, or at the Baths of St. John in Rapolano Terme surrounded by wild nature. I prezzi sono per 2 persone. Essi comprendono: piscina, biancheria da bagno-camera-cucina, lavanderia, internet wi-fi, parcheggio, gas, elettricità, area barbecue e pulizie finali. Essi non comprendono il costo del riscaldamento, quando necessario.